The Old Fella's Cookbook: Dr Q, I presume…..? Once a year there comes a time that strikes fear into the hearts of those of us who are married or partnered to knitting people. People who knit we can deal with, but people who treat knitting as a 35 year old single man living with his parents treats Star Trek are truly terrifying. And spinners. Don’t forget the spinners…..and crocheters (if that’s a word). Once a year, these people amass in the fair County Cork to touch, fondle and otherwise molest innocent wools and yarns in the name of FIBRE FEIS, the annual gathering of the immortal fibre enthusiasts who fight to the death until the last one stands - THERE CAN BE ONLY ONE………..Well, OK that’s Highlander the movie but c’mon, wouldn’t that be great?? So Fibre Feis is an annual gathering of friends and family who get together once a year to meet up, camp over and discuss all things…well… fibrous. No, not the dietary kind – that’s a way different party. Long story short, Fibre Feis is a great bit of fun and food (and not an inconsiderable amount of drink) and this year was no exception. It is a BYO affair with contributors bringing everything from tomato and mozzarella salads to couscous, brownies to artisan chocolate cake and homemade beers (thanks Phil). This year I decided to bring Dr. Pepper Pork Chops and Sinéad made two fabulous Madeira cakes (from a closely guarded secret family recipe). Thankfully, people were polite and said they enjoyed them although this did appear evident by the fact the first plate of finished chops were gone in seconds…..
To Sue and Phil and to all those who organised, contributed and turned up – many thanks for a great day and we’ll see you again next year. For those who asked, here’s the recipe – I used this volume for 12 chops. 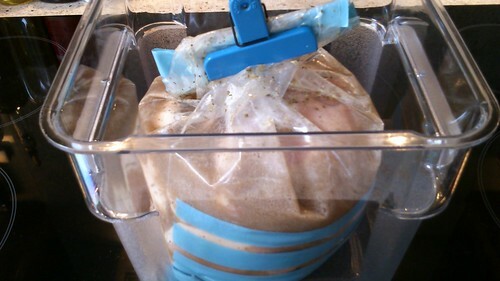 Mix all the ingredients together into a zip top plastic bag and place in a container. 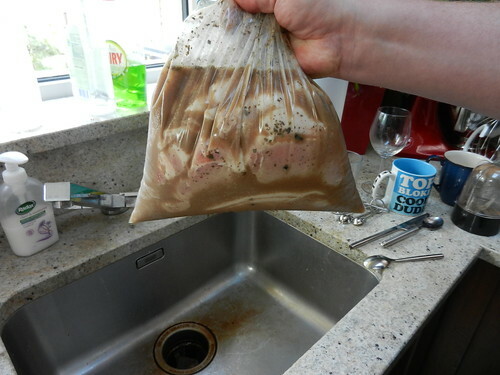 Place the pork chops into the bag and squeeze as much air out as possible before sealing the bag. Place the container in the fridge for 4 but not longer than 8 hours. 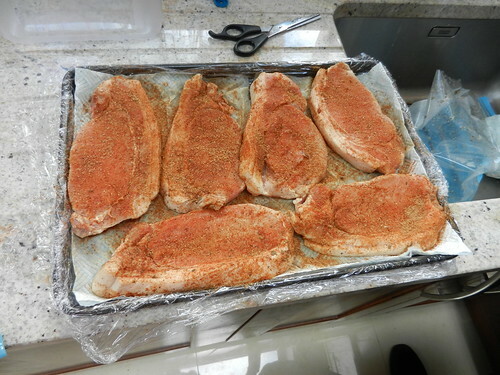 Take the pork chops out of the brine and pat dry with kitchen paper towels ahead of applying the rub. 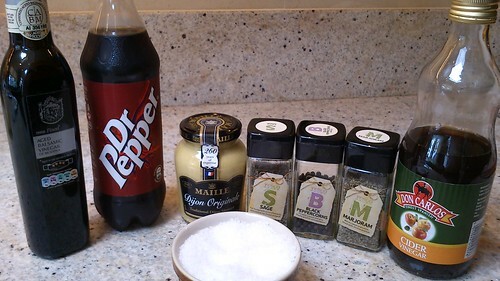 Mix together well and apply liberally to both sides of the chops (I use a small flour shaker). Fry, grill or BBQ as you would for a normal chop - 7 to 10 minutes depending on the thickness of the chop and method of cooking, turning once half way through. Thanks! 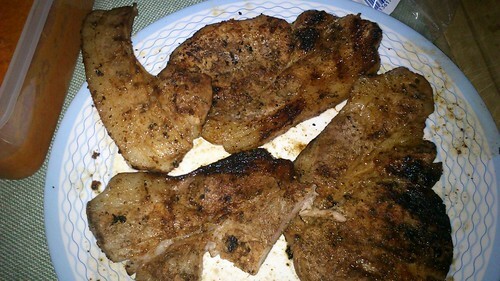 These are the only chops I've ever had that I like as much as (or possibly more but I'm not ready to admit it) than mine. Sinead's cake was best Madeira ever! 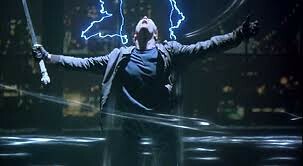 We love having you all of you down for Fibre Feis. Great for the OH's to get some support regarding their fibre addict.